After NASA was forced to back out of the joint ExoMars mission with the European Space Agency due to budget constraints, it looked like the exciting rover-orbiter mission might not happen. However, ESA went elsewhere looking for help, and has now announced a tentative cooperative arrangement with Russia’s space agency where Roscosmos will provide the two launch vehicles for multi-vehicle European-Russian ExoMars missions in 2016 and 2018. Plans are for the mission to have an orbiter for launch in 2016, plus an ESA-built rover mission in 2018. 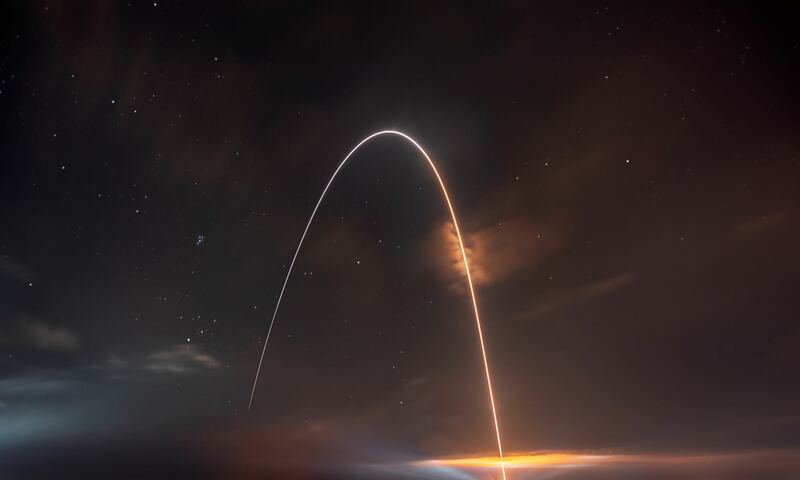 Roscosmos will provide Proton rockets for the launches of the two missions, as well as providing an instrument for both the orbiter and the rover as well as overseeing the landing of the rover. The orbiter would study Mars’ atmosphere and surface and the six-wheeled vehicle would look for signs of past or present life. The orbiter would also provide telecommunications for the rover. Frederic Nordland, ESA’s director of international relations, said the agreement would be finalized before the end of the year and that its principal characteristics are already known and accepted by both sides. The announcement was made at a meeting in Naples, Italy this week of ESA’s space leaders from the 10 different nations that comprise the organization. The leaders are discussing future objectives and priorities for Europe in space, with the aim of shaping the development of Europe’s space capability. During the meeting, Poland officially joined ESA, becoming the 20th member of the European space organization. It joins the other member states of Austria, Belgium, Britain, the Czech Republic, Denmark, Finland, France, Germany, Greece, Ireland, Italy, Luxembourg, The Netherlands, Norway, Portugal, Romania, Spain, Sweden and Switzerland. ExoMars is now expected to cost ESA about 1.2 billion euros. So far, 850 million euros has been committed by the participating members, but officials remain confident the remaining funds can be raised. ESA officials also said Russia’s Proton rocket might be used to launch Europe’s Juice mission to Jupiter in 2022, saving ESA’s science program some 170 million euros. I REALLY hope Russia can pull it off this time, cause their record wih Mars hasn’t been exactly stellar. And then, maybe the US can learn a lesson or two and think twice before slayering its planetary science budget again (yes, I’m still grinding my teeth over the recent budget cuts!). Go Europe-Russia! Fortunately It looks like Russia is just providing the rockets – which have a good track record, and an instrument, which will probably be non-mission critical (and probably wouldn’t fail anyways). It’s when they are building the whole probe that you start worrying. However I am concerned that Nancy says that they will be “overseeing the landing of the rover”. What does this mean? On this point Russia’s track record is definitely not good. And what about the exomars edl demonstrator? I thought the whole point was to give ESA experience landing. But certainly I’m hoping for the best, and I’m glad that ESA found another partner after NASA dropped them on this one. Failure with Proton doomed Mars 96, so I’m not too happy that they are using Proton instead of an Ariane. I think the demonstrator is still in the plans, it’s been mentioned in open jobs that have been posted for the companies involved in the ExoMars project during the last day after it got the approval to move forward. The problem would be the interplanetary trajectory injection stage construction. If it is the Russia standard it is a good one, but they can no longer produce it at quality as the recent failed Phobos-Grunt mission reminded us of. Elon Musk is all talk, a salesman whose yet to show that he can deliver all the big talk. He’s largely targeting the US government launches, where no international competition is allowed anyway. Overall the need for launchers is increasing globally, so there’s ample room for Arianespace even if Musk would make it big. Ariane 5 was intended to be used in ExoMars originally, so it could well have been used. It is still certainly possible that Elon Musk is all talk on the vital issue of prices. However it is not accurate that he is only targeting government launches, I count something like 20 commercial launches already scheduled over the next four years or so. If those get launched, at the advertised prices, and SpaceX is still in business, consider it settled. His first big commercial launch was the casualty of the ISS cargo mission. In 2011, US government and private US companies launched a total of 18 rockets carrying satellites. There’s ample room for growth, worldwide. 2008 there were 68 launches worldwide, 2009 78, 2010 74 and 2011 84. Ok, now the discussion is moving off topic. But just to constrain the new subthread, these heavy launchers are not able to corner the whole market. We need to look at their segment. And as for that, I believe Ethan is correct. As for Orbcomm we don’t know if they have been receiving “bad treatment”. The low prize may be all the good treatment they need in the balance. – The failed orbit insertion was a logistically complex failure of mixing it with the ISS mission, with Orbcomm’s permission. And as it turned out it was not a failed mission, because Orbcomm got the data they needed, check their web site. – It isn’t a delayed project, finish date is 2014. When they plan these, they insert launch and other failures as possible delays. I don’t think we can take a failed orbit insertion, which they would have been perfectly capable of if not nixed by NASA’s security rules on ISS, as a sign of anything at all, except possibly the vaunted robustness of the Falcon. (But I don’t do “omens”. =D) I would be happy to move it off the table and return to the question of Ariane as a realistic interplanetary platform in the future. It is not *all* talk. Which is presumably some of what the discussion to move to the next generation of Ariane is founded on. I hope Germany can find other partners to make the Lunar Lander a reality, but I’m really relieved that ExoMars will get it’s chance. It’s the first Mars mission whose main goal is to find life on the red planet. In the above ‘artists concept’… the wheels look way too small and the body of the rover too high to negotiate much of a slope… just saying. Why do you have to say ‘just saying’ at the end. We know you are saying because we can see the text you typed. However, they still play tag team on mission goals (as Raimo’s comments remind us of), so this can speed up discovery rate in comparison.